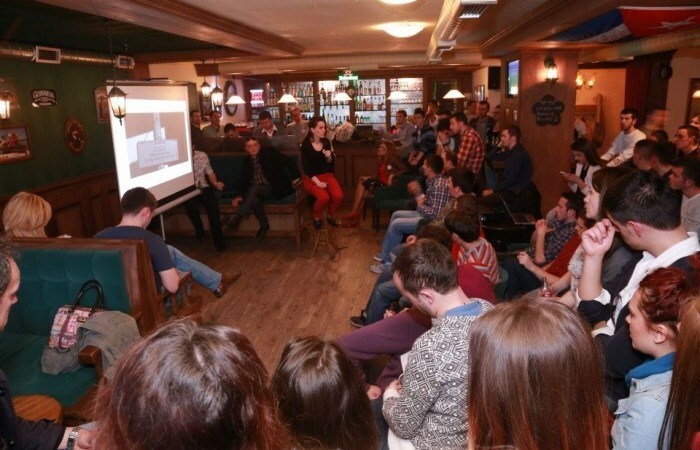 More than 120 people gathered in Gjakova for the first BarCamp organized in this city. A dedicated artist whose aim is to make the city of Gjakova a more cultural friendly place, a teacher of art and a technology geek were in the main focus of this event. Gemb Xërxa, Fleta Baraku and Hekuran Doli were the guest speakers who showed their personal experiences and their thoughts about the fields that they belong. Gemb Xërxa, a known figure in the city of Gjakova for his passion for art and for exposing some of his artwork in different cities around the region, presented his experience in this field and his commitment to make the city of Gjakova a more cultural friendly place. Interestingly enough, he showed some projects that indicated new things like the presentation of the money-flower which he build with a 3,000 euro loan, and because of which the Gallery of Arts in Prishtina installed cameras for the first time in order to ensure its safety. Gemb also told the audience about his plans to build a monument in the city, whereas he is also expecting that the community will support him. “It’s a kneeled statue made up of steel letters, and I think that it will become some sort of a Newborn monument for Gjakova, so that the city gets identified more from the monument, rather from the hotel Pashtrik” he said. The audience had dozens of questions, going from the materials that will be used for the statue, to the place/location, materials/money needed, etc. Fleta Baraku, a teacher of art and a project manager in the Center for Education and Professional Advising “Gjon Nikollë Kazazai” expressed her experience in the work field, by showing how she left her first job because she was limited in here working environment, while in the other job working as an arts teacher she had freedom to do creative stuff with the pupils. Fleta told about projects of youth exchange undergone through the NGO Twelve. “Twelve is something that me and my friends founded, and named like that because of working after midnight hours” she told the audience. Fleta also praised the BarCamp event about the importance of this event, that is having huge impact on the youth and that it is a responsibility to talk and present towards an audience like this. She also emphasized a website called salto-youth.net where young people can login in and access free materials for new skills. A geek was left to present last during the event, but he was very energetic and thrilled to share his tips on how to become an IT Professional in the informal way. He focused on big companies like Sprigs, 3CIS and “Rrota” which are having trouble finding professionals in the local market, because of the lack of interest of the younger generations, but he said that, besides faculty based education, there are also other options like khanacadmey or codeacadmey that give people the chance to learn many things for free. He gave some tips on how to be more strongly presented online by completing a Linkedin profile, building a portfolio, earning awards and certifications and so on.